Muse is a band that is easy to disregard. Their albums are celebrations of structured noise, “improper” singing technique (breathe at all the wrong times, Matthew), and their lyrics are generally shallow. Indeed, their lyrics tend to present the world as a series of challenges one can either win or lose. Defeat and victory are explored in a way not unlike the form of a AAA video game. The goal is to win at life, whatever that means. The same tendency is on display in movies like Battle: Los Angeles where the characters move from checkpoint to checkpoint, doing side quests and leveling up their weapons. It is the world of narrative imitating gaming. Of art imitating art. 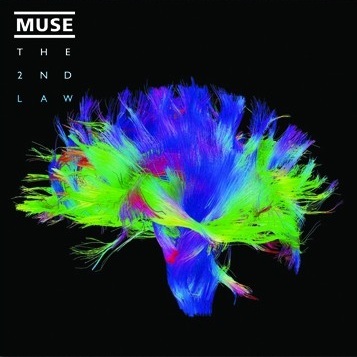 Which is what makes The 2nd Law such an interesting album. There are still the odd songs about winning (“Survival” is the one that sticks out the most). But the album is so much less political than their previous work, so much less about fighting back. Instead, it is applies the second law of thermodynamics, from whence it derives its name, as a kind of extended metaphor. The contemplation of this law, that the universe tends toward maximum entropy, gives the songwriters respite from the constant winning and losing. The second law, in Muse’s estimation, means that winning in any ultimate sense, is impossible. Why so little denouncing of political figures on this album? Because in the long run, the sun dies and civilization perishes anyway. This album brought to my mind Marcus Aurelius who, in his Meditations, expands the contemplation of mortality typical of Stoicism. He asks his readers to go to a cemetery and look for the graves marked “the last of his line.” All the work to secure an heir, the emperor notes, all the anxiety of maintaining a honorable name – lost and in vain. When we think of mortality, we ought not merely to consider our own, but to reflect on the mortality of everything. The 2nd Law reflects on this grand sense of mortality, and does so well. In each arena, from the politics of “Supremacy” to romance in “Big Freeze,” we see each thing coming to an end. Not in the video game’s decisive headshot, but rather the inexorable fading and reduction to nothing. As is most evident in “Big Freeze,” our human task is to hold as tightly to the reality that remains, beg it to stay, but realize that in the end, we must lose as what was real fades to gray. Muse isn’t the first to think deeply about the vanity of everything. The Stoics did, and the author of Ecclesiastes did before them. May we acquire true humility as we follow their example. Muse has always been on the edge of my music radar as interesting but not quite there, wherever “there” is. If they’ve matured on this album, that’s good news, and I might have to give it a shot. But I wonder if Christianity shouldn’t offer a hope that extends beyond what Muse offers lyrically. There is a kind of humility in this sort of thing, but if if entropy should cause us to retreat from hope for the future, then I don’t know if we have followed Christ’s example. This hope should distinguish the Christian existentialist from the nihilist trying to exercise his will to power to make the present have some kind of meaning. I heartily agree that Christianity offers hope beyond a thorough examination of our mortality. To my knowledge, Bellamy is not a Christian, so I don’t expect him to have the hope we do. That said, releasing oneself from false hope is valuable by itself. Jazz is still jazz, is life wisely expressed– as you described it above regardless of the acoustic signature your ears hear.